Boston has always been seen as one of the centers of American innovation. But not all of the city’s technological contributions came from its famous universities or tech companies. Boston was originally a shipping town. Its concentration of skilled workers and institutional knowledge helped it become one of the main centers for ship construction in the country. The efforts were magnified when the U.S. Navy designated Boston’s Southern Naval Annex as one of the main centers for America’s maritime war efforts when the country was dragged into the Second World War. During the war, over 50,000 people worked at the Naval Annex and neighboring South Boston Naval Base overhauling American ships as well as warehousing and distributing a wide range of military goods and supplies. After the war, many of the large ship houses were no longer needed and the area closed in 1974 and purchased by the City of Boston to become the Boston Marine Industrial Park. One of the buildings, a eight story, 1.4 million square foot supply warehouse was eventually turned into the Innovation and Design Building (IDB) where it now houses a mix of companies and industries that include architecture and creative service studios, specialized manufacturing facilities, research and development firms, and technology start-ups. The building’s owner, Jamestown LP, has been proactively employing innovative technology and amenities including a tenant engagement platform called HqO to help engage the workplace community. 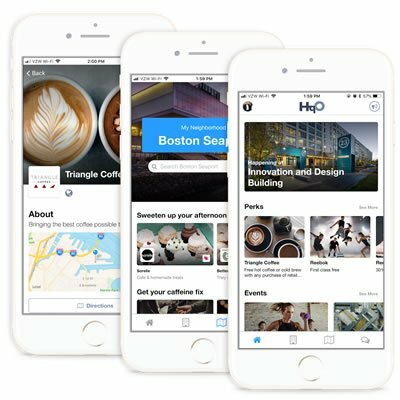 The technology gives tenants access to a mobile app that provides important notifications, inside track on the building’s amenities, and promotions from local businesses that hold events in the space. Garbarino touted that, “In just 4 days at the IDB, we were able to tell Jamestown what amenities performed the best, what offerings tenants would appreciate and pay for on an ongoing basis, and what new types of amenities or experience improvements tenants would like to see moving forward.” His example was that during their launch week, they offered free manicures onsite that booked up almost instantly. After the demand for this type of service they were able to convince Jamestown to bring manicures services onsite every week as a tenant perk. Much like the Boston’s contributions to marine technology, when knowledgeable people come together, great things can happen. The states biggest incubator, MassChallenge, is a major occupier in the building. They use the campus’ outdoor space to test and promote their retail brands in structures made out of shipping containers. The experience that they provide tenants and the valuable feedback and connections that the tenants give back creates a virtuous cycle of collaboration. The IDB building, and the Boston seaport, has changed the course of America’s history. Now, thanks in part to a cutting edge software that can connect the tenants to the building and each other, it’s helping shape the future of work as well.